Ogletown Resilience: Will NCC and DE turn a blind eye to the worst of unethical behavior? Will NCC and DE turn a blind eye to the worst of unethical behavior? 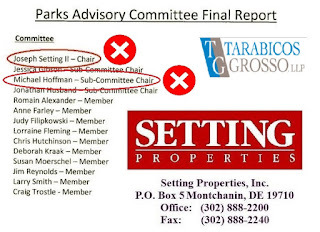 We will continue to remind everyone that the Chairman of NCC Executive Meyer's Parks Transition Team, that wrote the final report determining where regional parkland is prioritized, is the Registered Agent of two LLCs overseeing the development of the Orphanage Property. It sounds unimaginably hard to believe that this level of corruption -- clear to the naked eye even among the least politically savvy -- is acceptable at any level of govt, but it is apparently. 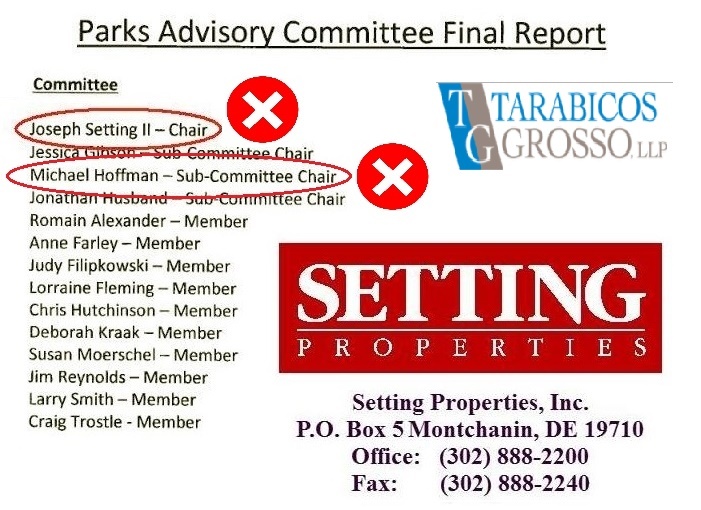 But not only was Mr Setting appointed the Chair by Mr Meyer, but Michael Hoffman of Tarbicos-Grosso LLP -- the law firm representing the Felician Sisters -- was also appointed chair of a Park's Team's subcommittee. With this level of influence presiding, does anyone honestly believe that Ogletown-S.Newark would have a snowball's chance in hell at our only chance of getting one? Yet, Senator Townsend doesn't think for a moment that this was an issue. In fact, he believes the simple fact that the "Rt.4 corridor" was just on the Team's list was enough to absolve them of any bias. Further disturbing is that no attorney would help STOP, nor would they even touch a case like this. They won't touch the illegal Traffic Impact Studies and other show-stopping issues with the Chestnut Hill "Preserve" also, all because they don't want their careers "threatened". In other words, they're all in bed together, most especially the land use attorneys, who would threaten anyone the moment their client's profits were in doubt. This includes Widener, Greenprobono.org, etc. Not a one. Anyway, this is what we're up against, folks. Total and absolute corruption. It's absolutely disgusting, and this is but one reason why we hold our two State's legislators (one an attorney himself) equally accountable; that they would stand idly by while such corruption continues unabated, and not make the least attempt to stop it despite our numerous pointers on how to do so.